Real Madrid president Florentino Perez and his quick trigger have struck again: Rafa Benitez has been fired, and the club has turned to Zinedine Zidane. Two weeks after Real Madrid's biggest win in 56 years, a 10-2 drubbing of nine-man Rayo Vallecano, club president Florentino Perez sacked coach Rafa Benitez and appointed former club great and current reserve-team coach Zinedine Zidane as his replacement. The news broke Monday evening following an emergency board meeting in the aftermath of Real Madrid's 2-2 draw at Valencia Sunday night. In some quarters, the surprise was that Benitez lasted as long as he did in the hot seat: his side has not beaten any of Spain's top teams this season, drawing with Atletico Madrid (1-1) and Valencia, and losing to Sevilla (3-2), Barcelona (4-0) and Villarreal (1-0). Even the Champions League win over Paris Saint-Germain that secured top spot in its group was a fluky 1-0 with a goal against the run of play. There have been rumors of unrest among the camp ever since Benitez arrived at the Bernabeu after the surprise (and some might say unfair) sacking of Carlo Ancelotti. His first move, reportedly, was to speak to Gareth Bale and move him to a No. 9 position, which was said to have upset top dog Cristiano Ronaldo. Stories that Benitez tried to instruct Ronaldo and Luka Modric on basic technical matters were cited as poor examples of man management, while his defensive approach was said to be unpopular with many players. He often tried to shut up shop after going ahead in games, which did not go down well with the fans. There are two sides to every story, though, and as no club is more political than Real Madrid, there are probably even more than that. As it stands, Real Madrid is only two points behind Barcelona in La Liga (and four behind Atletico) and has a favorable draw vs. Roma in the Champions League round of 16. Benitez's record through 25 games was 17-5-3. "My way of coaching, especially with players who can analyze a game, it is not to give orders, but to teach them," Benitez told France Football before taking the Madrid job. "If we do not agree, we can discuss it. It is no problem for me. What they learn, they will remember forever. That's the way forward: when players enter a dressing room at halftime, they must know you have a plan. Perhaps it is not good! But they have to trust you. You never win trophies if your players do not trust you." That trust, it seemed, was the biggest problem at the Bernabeu. Whereas Ancelotti was the ultimate manager of big egos, using his diplomatic skills to ensure the dressing room remained harmonious, Benitez is a micro-manager. The dressing room was as leaky as ever with constant speculation over Ronaldo's body language and happiness. Benitez's departure came one day after unconfirmed reports that Ronaldo is set to extend his Madrid contract to 2020. Players like Isco and James Rodriguez were unhappy with their lack of game time, while Benitez's reluctance to give Jese chances from the bench riled the fans. The key moment was the 4-0 loss to Barcelona at the Bernabeu back in November. The scoreline flattered the host and the team Benitez picked seemed designed to keep his job rather than get the result. He dropped Casemiro, one of the few successes of his reign, and started with Toni Kroos, Modric and a half-fit James in an ill-fitting midfield. His selection of summer signing Danilo over the more defensive Dani Carvajal allowed Neymar the freedom that led to Madrid's disaster. As the game played out, it was not Ronaldo, Bale, or even Benitez that was booed. It was Perez, he of the notorious quick trigger. "Florentino, resign!" was the cry from the stands. Last month a banner was removed from the Bernabeu that read: "Not ultra, not violent, just tired of your dictatorship, Florentino." 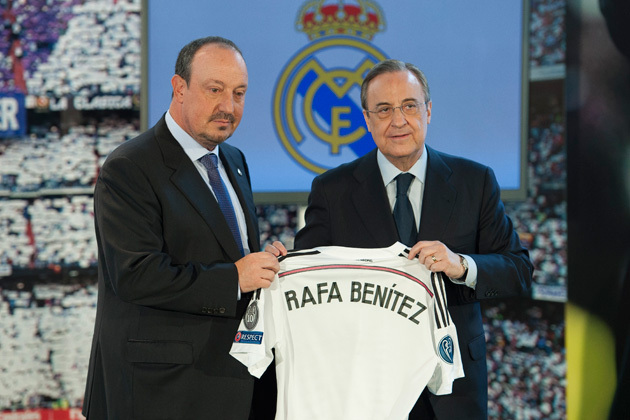 Benitez was a convenient shield for Perez against the fans' criticism. 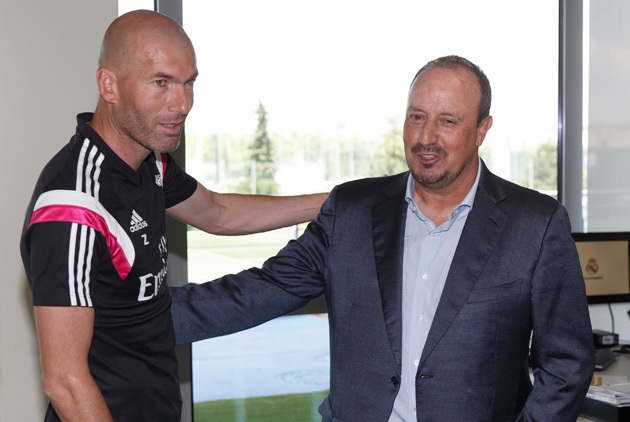 Amongst all the smoke and mirrors was the claim from El Larguero that the players asked Perez to get rid of Benitez. Whether that is true or not, Perez is the master of self-protection, and this time he has called back the hero, the legend. Zidane is one of the best players in the club's history, the ultimate galactico, ­but he is also, at this level, a coaching novice. Just because Pep Guardiola made the leap from Barcelona B to the senior team and enjoyed tremendous success, does not mean Zidane will do so with the same outcome. The Frenchman will certainly have a longer grace period given his past with the club, not to mention taking over midseason. But in what normal industry does a total novice get the chance to lead one the richest and one of the most successful companies in that sector? Nevertheless, one of his supervisors from the French coaching school that helped with his qualifications, Guy Lacombe, is convinced that Zidane will be a success. "It sounds like it's his destiny," he told FourFourTwo last year. "He is a great listener. When someone talks, he listens. I can tell it's pretty rare among the players. And he wants to be a coach. Every coach I know believes in him as a coach. He is patient. He's building his career bit by bit. The diplomas. Then the youth team. He gives himself every weapon to succeed. He will be better once he knows his players better. And he will be better once he has great players." Perez has bought himself more time, then, while for Benitez, the frustration will be clear. Benitez played for Real Madrid Castilla for seven years and began his coaching career in the club's youth teams. Of all people, he should have understood how things worked at Real Madrid. If he was going to go down, he should have gone down his own way, rather than trying to pander to a president who never had his back, but was only covering his own.